Tom Brunt is currently a mobile broadcast engineer who is responsible for mobile production trailers that provide equipment for live network level sports telecasts throughout the US. He has been involved in various roles of video production for over 30 years. When not out on the road, Tom offers his skills in video for community events and organizations in the Doylestown, PA area. Never one to shy away from new technology or its challenges, particularly as it relates to video and new media content production, Tom has expanded his knowledge base to include drones, 4K and now 360 Camera technology. Having an engineering mindset has also brought with it a constant interest to “solve a problem”; and with that, experiment with 3D printing technologies and design. 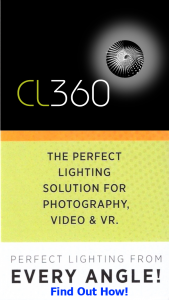 As part of solving a problem, he is currently developing a lighting instrument designed specifically to work with the challenges of shooting 360 photo/video/VR content. Now in the patent phase, Tom plans to present to the marketplace early next year.